Manufactured from 22-gauge steel with powder-coat finish. 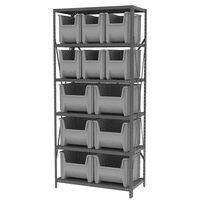 Shelving units are sold as complete units as shown, easy to assemble, using nuts and bolts only on the top and bottom shelves. 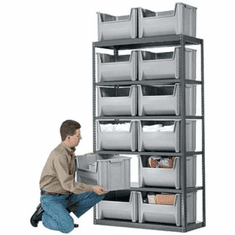 Other shelves are quickly assembled, and can be adjusted using compression clips. 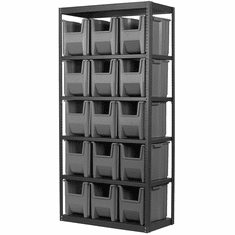 Replacement Single-Bins or Multi-Bins are available. 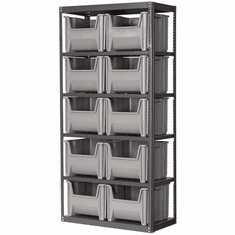 Featured: 8AS1879G Shelves: Shelving Unit Dim. (Dx W x H): 18" x 36" x 79" Wt: 103 lbs. Featured: Bin No: Bin OD Dimensions.